The EMMA Collaboration takes place every other year. The next Collaboration event will take place in 2020. 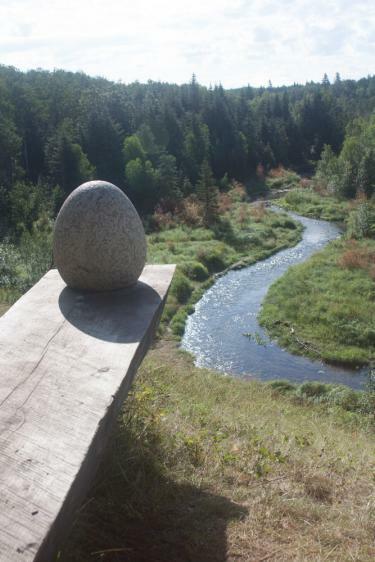 In 2012, MECA introduced a new relationship with the EMMA International Collaboration, which brings 100 renowned artists and craftspeople together from around the world to create art in in the Boreal Forest of Northern Saskatchewan, Canada, a place where form and function collide. Known as “Emma,” this biennial week-long residency is an innovative workshop model for unstructured creative collaboration between artists working in traditional craft and those engaged in contemporary method and has become a catalyst for worldwide creativity in the arts. One applicant is selected to represent MECA at the Emma Collaboration, which funds the conference registration fee. MECA funds the participant’s travel expenses. The selected applicants is responsible for housing (free camping option) and meals costs. For more information about this opportunity, please visit www.emmacollaboration.com, call the Alumni Office at 207.699.5018, or email alums@meca.edu. Click to subscribe to the EMMA Collaboration mailing list and find out about future residency opportunities and updates. Participants experience 7 days of spontaneous and collaborative art making in a variety of media: blacksmithing, small metals, raising, drawing & painting, furniture, woodworking, turning, stone carving, weaving, sculpture, glass, ceramics, printmaking, leatherworking, clothing & fibers, and more. Citizens of the United States (U.S.) traveling between the U.S. and Canada require a valid U.S. passport. MECA funds the participant’s travel expenses up to $500 and the $1,500 conference fee and includes meals and lodging. Every two years, one hundred artists from across the globe come together in the boreal forest of Saskatchewan to share in an experience of raw creation and open possibility. Artists at various stages of their careers are challenged to step outside their usual art practice, to explore medium, technique and subject matter through hands-on collaboration and exciting creative exchange. Before applying, please review all the information on application requirements and instructions, as well as information about the EMMA Collaboration. For artists submitting images: digital images of your work are required. All images should be formatted as jpegs with a minimum width of 800 pixels and a maximum of 1024 pixels per side, saved at a resolution of 72 dpi. Name your image files as follows: LastNameFirstNameNumber.jpg (i.e. OkeLillian01.jpg, OkeLillian02.jpg). Do not include any spaces, dashes, or other symbols when labeling your images. Image information, including title, date, media, and physical dimensions of each piece, must be supplied in the space below each image upload. For time-based/ new media work: Supply URLs for 3 links via YouTube, Vimeo or Soundcloud to video or sound pieces less than 8 minutes in length. All submissions must have been completed within the last three years. All documents listed above should be saved as a Word document or a PDF.